he decade of the 1870s is one of the most complex periods of women's fashion. 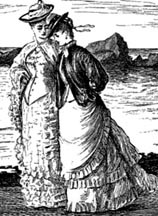 The style of the early 1870s (indications of which had been seen in the late 1860s) relied on the revival of the polonaise, drawn back, bunched and puffed up into an elaborate arrangement at the rear, over a supporting bustle or tournure; the tight-fitting bodice was still short-waisted, the sleeves plain, easy-fitting and finished with a ruffle or cuff, tending to widen slightly at the wrist. The underskirt, trimmed with pleated or gathered flounces, gauged sections, tucking and/or ribbon bands, was trained. The earlier bid for simplicity and freedom was overwhelmed by a profusion of puffs, ruchings, fringes, ribbons, drapery, flounces with additional headings and edgings, and strange combinations of materials and colours. "Rather plain masculine-style jackets were introduced" -- detail of an illustation by George DuMaurier. Around 1874 rather plain masculine-style jackets were introduced, paving the way for a new fashion typical of the second half of the 1870s, the cuirass bodice; extremely tight-fitting, long-waisted, boned and descending over the hips, it moulded the body like a corset. This and the princess sheath dress or polonaise which had a similar line with bodice and skirt cut in one (popular between 1878 and 1880), were associated with the Princess of Wales, later Queen Alexandra. Although Paris was fashion's focal point, the gay, sociable and well-dressed Edward and Alexandra had their followers; in America the activities of the English Court and developments in English fashion, particularly for sport, were of great interest after the Prince of Wales's visit in the 1860s. Both the cuirass bodice and the princess sheath were worn without a bustle but possibly with a small pad. The skirt narrowed, fitting the figure almost to the knees and tied back tightly with ribbons inside to flatten the front which might be draped symmetrically or asymmetrically, trimmed with fringes, flounces, etc. The back skirt was draped and decorated even more elaborately and finished, except for active sport, with a train reminiscent of a peacock trailing his closed tail. Sleeves, set into a normal shoulder, were slim fitting; on evening and dinner dresses they might be elbow-length but on ball gowns they were tiny, and the neckline was low in front, narrow and fairly high at the back. Frequently sleeves were of a different fabric to the bodice, the latter matching the underskirt, the former the overskirt, but in the late 1870s the combination of colour and fabric became less patchy, often using two fabrics of the same colour, one matt, the other shiny, or fabrics in two shades of the same colour, or a striped fabric with a matching plain one. Horizontal trimming or drapery seen on skirts of 1878-79 intensified in the early 1880s and the fashion for a long train declined for day wear. Left: "Interest was centred on the skirt, with pleats, flounces . . ." (1875). From about 1882 the plain, high-necked, tight-fitting day bodice grew shorter, cut to a point at the centre front and often, until the middle of the decade, at the centre back also. Sleeves were plain and tight. Interest was centred on the skirt, with pleats, flounces, draped panier or apron effects, kilting, braiding, etc. Trains, no longer worn by day, persisted for evening wear, often as a separate attachment which could be fastened under drapery at the back. Formal ball gowns were often sleeveless and the décolletage was cut slightly wider and to a point at both front and back. The return of the bustle, confidently announced in Paris in 1880, was not completely accepted elsewhere until 1885. Very different to the 1870s bustle, it was now worn jutting out horizontally from the hollow of the back, its supporting structure more rigid as in the Cranfield or Langtrey bustle where an arrangement of metal bands, working on a pivot, could be raised when sitting and sprang back automatically when the lady stood up. This large protuberance naturally required a wider skirt. A certain aggressiveness and rigidity about the erect, square-shouldered female figure during the mid to late 1880s (the sleeve head was raised and slightly gathered by 1888), appears to reflect the increasing demand for the emancipation of women. Notable at this time was a liking for military dresses, and the tailor-made became high fashion, largely owing to the couture house of Redfern in Paris. Redfern's designer at that time was an Englishman, Charles Poynter, and English tailor-mades were eagerly bought by American and European women. Only the bodice or jacket was tailored, the skirt remaining elaborately draped to emphasize the tiny corseted waist. The bustle' gradually diminishing in size, became a mere pad by about 1893, and the silhouette changed to an hour-glass figure; but simultaneously the small gathered sleeve-head of the late 1880s began to grow in earnest by 1892. Expanding each season, sleeves reached an enormous size by 1895-6, each requiring something like 21 yards of material. Close-fitting from wrist to elbow, they swelled out to reach such proportions that women must have had to turn sideways in order to pass through doorways of moderate width. Like those of the 1830s, they were called leg-of-mutton or gigot sleeves, but they were now set into a high or normal armhole with the width at shoulder level, rather than swelling from the low dropped armhole of the 1830s; as in the earlier period, evening dresses often had a lace flounce added above the sleeve to increase the impression of width. The width at the shoulder was balanced by added width at the hemline. Skirts were gored to give a fairly close-fitting effect over the hips, widening in a straight line to the hem; some pleating from the waist-band was retained at the back and a certain amount of padding was added when necessary to round out the hips. As skirts became plainer, the tight, high-necked, high-busted and long-waisted bodice became more ornate, with lace jabots or frills, cross-overs or epaulettes. Designs from the French couture houses of extravagantly expensive, elaborate gowns in velvet or satin, richly embroidered or trimmed, might dominate the fashion pages of English and American periodicals, undoubtedly appealing to the wealthy and influencing many, but a preference for the tailor-made suit, and in particular the image of the American Gibson girl, elevated the combination of blouse or 'shirt-waist' and skirt into the realm of fashion. Ready-made blouses could now be bought in great variety, high-necked and masculine' or dressy enough to wear with a plain skirt on informal evening occasions. The tailor-made suit of the 1890s had a three-quarter-length jacket, wide revers and enormous sleeves, a plain skirt to instep or ground level, and might also sport a waistcoat. These somewhat masculine styles often have a certain provocative charm and indicate not only the working woman's desire to look smart but also the increase in active sports for women, and it was during this decade that cycling became the rage. Arnelia Bloomer died in 1894, and although the rational dress she devised in 1849-50 never attained popularity in her lifetime, a year after her death a form of knickerbockers called bloomers, very full and extending to below the knee, became a popular cycling costume for women. From 1896 the size of the sleeve decreased and the next fashion cycle began to take shape, heralding the S-bend typical of the early 1900s; with the bosom appearing fuller and lower, an exaggerated fullness was gathered at the front of the bodice overhanging the straightened front of the skirt.